Clumps of matter stream out from jets around newborn stars in a new series of videos made from Hubble Space Telescope observations. New details about the violent birth of new stars are revealed in a series of movies compiled from 14 years' worth of Hubble Space Telescope observations. The videos stitch together pictures of nascent stars at various periods to present continuous-motion views of how stars are born. They reveal, in particular, how high-speed jets from baby stars can spew out matter in two beams that fizzle out over time. Stars form when clouds of cold hydrogen gas condense under gravity, pulling together until the material is hot and dense enough to ignite nuclear fusion burning. The budding star's gravity continues to attract more matter to it, which settles around the star in the form of a disk. Often gas and dust in the disk condenses to form planets that continue to orbit the star. But some of the disk's material can also be pulled back in toward the star and flung outward in the form of two jets aligned with the star's spin axis. 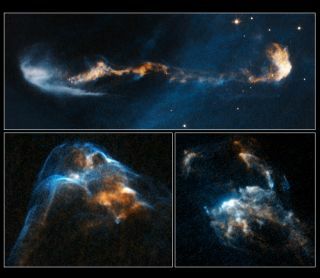 These images taken by the NASA/ESA Hubble Space Telescope show how a bright, clumpy jet, ejected from a young star, has changed over time. The jet, called Herbig-Haro 34 (or HH 34), is a signpost of star birth. The jets in the videos extend about 10 times the width of the solar system and contain material speeding faster than 435,000 miles per hour (700,000 kilometers per hour). Among the revelations is the fact that matter does not seem to spew out in a constant flow from the stars' jet pairs, but rather pumps out in clumps. These clumps stream at different speeds, with the faster blobs running into the slower ones to create glowing waves of heated material called bow shocks, the videos show. "Taken together, our results paint a picture of jets as remarkably diverse objects that undergo highly structured interactions between material within the outflow and between the jet and the surrounding gas," said Rice University astronomer Patrick Hartigan, the study's leader, in a statement. "This contrasts with the bulk of the existing simulations which depict jets as smooth systems." Hartigan and his colleagues created the videos by combining Hubble data of three different baby stars each around 1,350 light-years from Earth. The data come from observations made on Hubble's Wide Field Planetary Camera 2 between 1994 and 2008. The researchers hope the knowledge they've gained will help refine computer simulations that attempt to calculate the complex processes going on in the stars and their environs as they form. "For the first time we can actually observe how these jets interact with their surroundings by watching these time-lapse movies," Hartigan said. "Those interactions tell us how young stars influence the environments out of which they form. With movies like these, we can now compare observations of jets with those produced by computer simulations and laboratory experiments to see which aspects of the interactions we understand and which we don't understand." The results of the study are reported in the July 20 issue of the Astrophysical Journal.